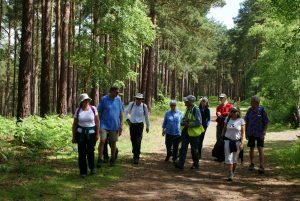 Farnham Town Council first introduced a walking festival into its programme of events in 2017. 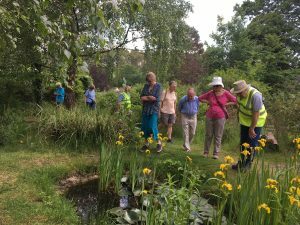 With some thirty walks over a week, including three organised by The Bourne Conservation Group, the festival proved extremely popular and it was decided to repeat the event in but over a two week period in 2018. Once again BCG was enthusiastic to take part, offering three walks broadly similar to last year’s. 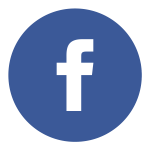 The Town Council will be holding a “sweep-up” meeting to review the overall success of the Festival and if, as seems likely, they make an early commitment to repeat the project next year, the BCG will probably wish to consider volunteering to lead one or more walks through our patch. 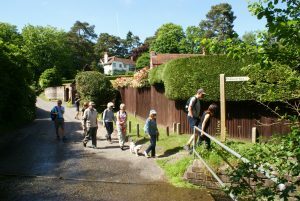 Richard Sandars and Charles Fearnley led this walk which focused on the development of the Bourne, particularly from the nineteen century, as described by George Sturt and other local writers. 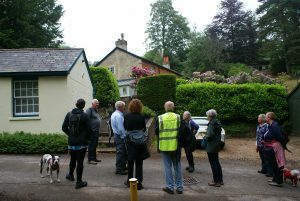 Starting at St Thomas- on-the Bourne Church, the first stop was the Victoria Reservoir where Charles described the geology of the area and how Farnham residents get their water. The group passed through Langham’s Recreation Ground and descended by footpaths to the river valley, by way of Middle Bourne Garden and returned to St Thomas – via the Bourne Crossroads, St Martin’s Hall, Deepdene and Old Church Lane with stop offs at Sturt’s home- Vine Cottage, where Richard spoke of Sturt’s life and writing, and the Old Churchyard. 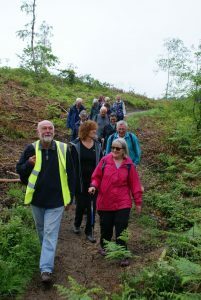 With 15 walkers, David Dearsley had a significantly bigger group than last year for his three hour walk that covered many of the Bourne areas attractions. Starting at St. Thomas on Bourne , the group passed through Paradise Wood into and through the Bourne Wood, and Sable Wood, before returning by way of Old Church Lane, past Vine Cottage and the Old Churchyard. 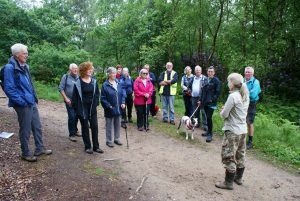 There were two “guest speakers” – Pam Eastwood from the Forestry Commission, who is responsible for filming and reptile protection in the Bourne Wood, and Bruce Callander the owner of Sable Wood – and this added substantially to the interest and enjoyment of the walk. The start of Martin Angel’s walk from the pavilion on The Bourne Green was slightly delayed by waiting for two missing walkers, but his co-leader, Isobel Girvan – who is a botanist with SWT – used the time profitably, finding two uncommon plants on the cricket pitch. Climbing up through Sable Wood, the group saw that most of the trees are of the same age – the area was flattened in the great 1987 storm. 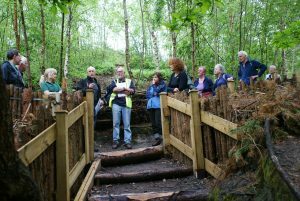 This group also met up with Bruce Callander, who gave a talk about his successful conservation work in the Wood. Passing along the edge of the Bourne Woods to the overlook of the Farnham Heath RSPB Reserve the group met up with Noel who had delivered Martin’s moth trap- set the previous evening which yielded 60 species of moth. Some were quite large species including elephant and lime hawkmoths and several fox moths. For Martin the most exciting catch was a melanic peppered moth. Before the Clean Air Act that put a stop to coal fires causing bad smoke pollution in Britain, most peppered moths had become black (melanic). Now melanic specimens are rare mutants, reportedly occurring in 1 in 2000 specimens. 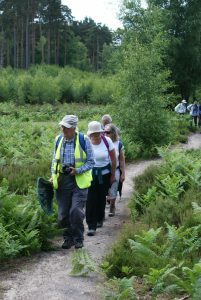 The walk continued across the Reserve, which has been converted from pine woodland, which had been planted during the twentieth century and restored back to lowland heath – now a rare but important habitat not only in Britain but also Europe. 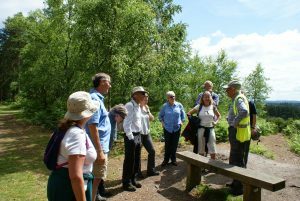 Then, back across the reserve and back into Bourne Woods, where the group paused to look at Gaultheria. This invasive alien plant was introduced to provide cover for game birds. BCG has helped Bruce to clear most of it from Sable Wood, but it is still a rampant problem in Bourne Woods.